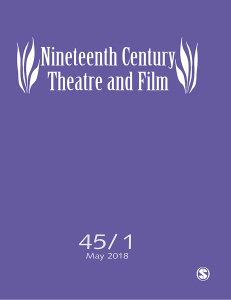 This special issue of the journal Nineteenth Century Theatre and Film (Vol. 45, no. 1, 2018) is on The Actress-Manager and Early Film. It explores how female entrepreneurial engagement in new commerce, new markets and new forms of theatre might help us interpret the rich and productive relationship between theatre and film, in carefully chosen case studies from the United Kingdom, France, Spain, Italy, Denmark, and the United States, tackling actresses such as Sarah Bernhardt, Betty Nansen, Eleonora Duse, Helena Cortesina, Marion Davies, and the female actress-managers of the portable theatre, a form of theatre which has – like the women in it – been consistently understudied. Edited by Victorial Duckett and Vito Adriaensens, it includes articles by Ann Featherstone, Victoria Duckett, Vito Adriaensens, Maria Pia Pagani, Elena Cordero-Hoyo, Begoña Soto-Vazquez, and Denise Mok. Domitor, the international society for the study of early cinema, is an association for people with a scholarly interest in cinema from its beginnings to 1915. © 2019 Domitor. All Rights Reserved.